In early October, Motorola announced that it would be shutting down a handful of its popular software applications, including Migrate and Assist. Those two are being phased out because Android 6.0 Marshmallow included similar features and so Motorola figured you would rather they save you space on your phone instead of doubling up on features already present. Those aren’t the only features going away, though. Motorola Connect, a Chrome extension that allowed users to send/receive texts, see who was calling them, and keep up on battery life and connection, is also being retired. We weren’t sure when all of these services were going away, but users of Motorola Connect noticed a message this week that said Motorola would be retiring it before December. In other words, November is the last month you can enjoy Connect’s features. 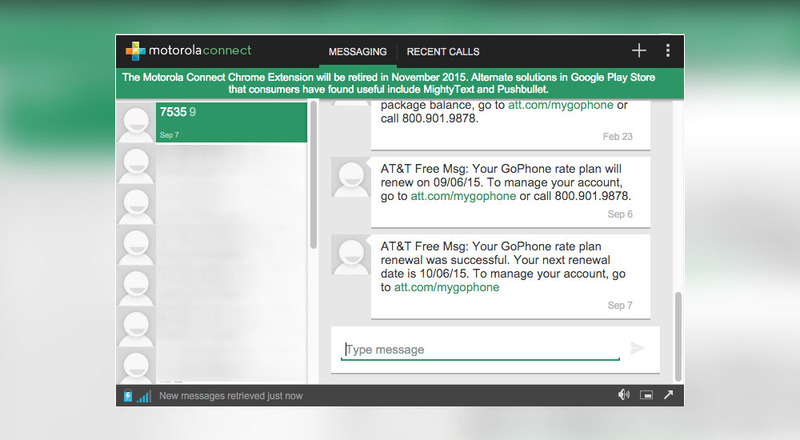 The Motorola Connect Chrome Extension will be retired in November 2015. Alternate solutions in Google Play Store that consumers have found useful include MightyText and Pushbullet. So there you have it. It’s time to find an alternative. While I haven’t used MightyText, a number of our readers do and can tell you why it’s awesome in the comments. As for Pushbullet, well, it’s been well-documented around these parts why we love it so much.